"A boy in a small town who has a different way of seeing. A curious girl who doesn't belong. These are some of the things you'll find within the Danger Box." As a fan of mysteries, these words immediately caught my attention. I love things that need further explanation and investigation. I also gravitate to characters who appear to be "different" in some way. A boy with "a different way of seeing" and a girl "who doesn't belong." These are characters with whom I wanted to spend more time. On my first read, I read the story through in one sitting. The cliffhangers kept me turning the pages. I will have to say as a read aloud, though, it was frustrating for my students to have me stop some days in places they might have continued to read on their own. The "game" that is introduced in the first chapter and continues throughout the story, and trying to figure out what exactly the players' final goal is. The 2nd chapter introduces us to Zoomy (the boy mentioned on the front flap), and the reader realizes he's in trouble as he hears footsteps coming toward him and his Danger Box. Then, Blue Balliett leaves us hanging and the book becomes a huge flashback for a quite a period of time. It makes life interesting as details about the main characters start to come into focus during this flashback. Many of my students really paid attention to the development of characters over time. They keep read aloud notebooks to track their thinking and a majority of them were gathering information about the many characters. Trying to figure out who was publishing all the Gas Gazettes, a free newspaper found in places around town. A mysterious code that comes into play later in the book. On a side note about this code, one of my students immediately figured out how it worked. 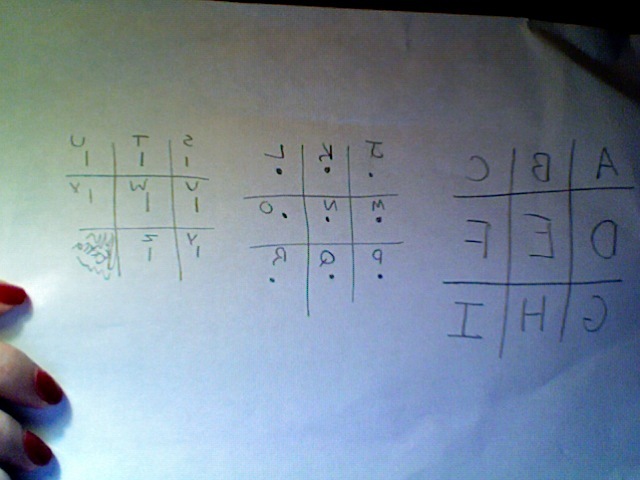 I've included a picture of how he figured it out (this will mean more to people who have already read this story / sorry for the image reversal). **This is a little bit of a spoiler** The ties in this book to Charles Darwin were fun for the students as well. The vocabulary - the two children who are the main characters collect good words; we did the same as a class. The concept of the "search box" -- Zoomy continually uses this item to find out more information about topics of interest to him on the computer. So, in our class, we stoopped calling it a Google search, but rather a search with the search box. The Danger Box is a fun addition to the other mysteries Blue Balliett has already written. 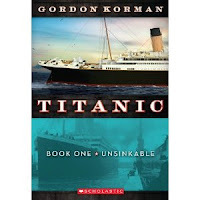 I recently had the good fortune to read an ARC of Gordon Korman's new series (possibly a trilogy) called Titanic. Book One of the Titanic series is called Unsinkable. Korman has done a fantastic job blending historical events with characters and stories the reader won't soon forget. In that way, Unsinkable reminded me of the movie, Titanic. I got so involved with the characters in the movie, I kept thinking, "Oh this time, they'll miss that iceberg!" The same happened to me with the characters in this book. I am so invested in the lives of the characters in Unsinkable, I can't wait for Book Two to see what happens next, even when I know full well what the final outcome will be. Darn it! I really care about these characters. Korman has done a fantastic job fleshing out very believeable characters (even if sometimes stereotypical). There is the slightly spoiled elitist rich girl, the stowaway running for his life because he picked the wrong person's pocket, the Irish gangster and his hoodlums (ok, I don't care quite so much about them), the girl whose mother was a sufferagate and recently asked to leave England, the boy whose father worked in the bowels of the ship feeding the steam engines of the Titanic, and Thomas Andrews, the designer of the Titanic. In each chapter, the storyline jumps from one character to another which results in quite a few cliffhangers. I literally couldn't turn the pages fast enough to find out what would happen next for each of the characters. And don't even get me started about the one surprise that happens at the end of the first book. Mysteries, secrets, and intrigue abound on-board the Titanic. Gordon Korman has written a series that most definitely will hold water with readers!! Unfortunately, the publication date for Unsinkable is not until May 1, 2011. Mark it on your calendar! It can't get here soon enough. Martha Freeman writes great mysteries for kids. She is the creator of the Chickadee Court mystery series that includes Who Stole Uncle Sam? and 3 others in the series. Since I introduced them to kids, they don't stay on the shelves. They are all well written accessible mysteries for elementary kids. Now she has come out with a new series that take place in the White House. 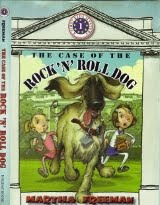 In the first book, The Case of the Rock 'n' Roll Dog, we are introduced to sisters Cammie and Tessa. They are the daughters of the president, living in the White House with their president mother, grandmother and Aunt Jen, who serves as White House Hostess. In this first book, the girls are adjusting to life in the White House, Secret Service, the protocol of being the First Children, and living with their annoying cousin Nate. They are the owners of a dog who is a bit out of control and prone to stealing things. That leads to the mystery when things start to go missing and the girls must discover who is doing it. Throw in a visit from popular boy band The Song Boys, a cast of White House employees that help the girls adjust and you have a really fun, easy to read mystery. I'll be recommending this to all of the kids at Bailey. It will be a push for some of the younger ones, just right for most third and fourth graders, and a quick read for the fifth graders. That's one of the reasons I really like this book, it has range! 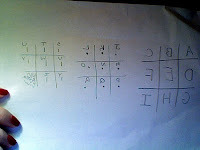 All kids can enjoy it and some will even solve it. Martha Freeman knows how to write for kids and I'm excited she is introducing another series. 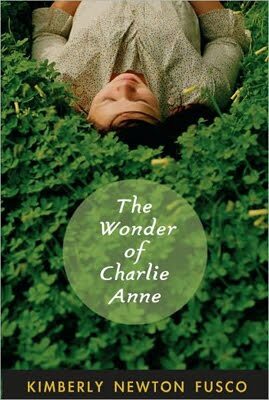 If I had read it sooner The Wonder of Charlie Anne by Kimberly Newton Fusco would have made my list of books deserving of an award. The title character is so strong and spunky that I was drawn into this book immediately. Charlie Ann is a young girl growing up in the Depression. As if that doesn't present enough obstacles, she has so much more to deal with. A single father that must go off to build roads leaving the children with a mean older cousin, Mirabel who has designs on their father. Her older sister, Ivy, who torments Charlie Anne, probably as a way to deal with her grief of losing their mother. Charlie Anne also deals with a learning disability and the memories of a teacher that verbally and physically abused her when she reversed her letters trying to read. Despite all of these negatives in her life, Charlie Anne thrives. She is smart about animals and how to do things on the farm. She can make the best vinegar lemon pie around and she knows how to entertain her younger sister, Birdie, entertained when she is unhappy. There's nothing like a good chicken race to lift little Birdie's spirits. Charlie Anne's life changes when Old Mr. Jolly across the street brings home his new bride, Rosalyn and her daughter, an African American girl named Phoebe. The community is shocked by this new family, both Rosalyn and Phoebe wear pants, and they can't believe that Phoebe isn't the hired help. Through it all, Charlie Anne and Phoebe become friends even though Charlie Anne has been told to stay away from Phoebe. When Rosalyn, a teacher, discovers that Charlie can't read, she sets out to help in a gentle, patient way with Phoebe as her assistant. It's through the re-opening of the school that we learn the back story of Rosalyn and Phoebe and how they became a family. It's a touching tale of the racism that occurred in the south. It's also the re-opening of the school that reveals the other side of the mean cousin Mirabel. Events lead her to start taking charge of helping some of the other families in the community and through this aid she begins to see the value of Charlie Anne and her gifts. All in all this is a touching story of family survival during one of our country's most difficult time. I really like how the community comes together to help one another and by doing that they all become closer. I think kids are really going to like this book, I know I did, and I'll be recommending it to all of my fourth and fifth graders. Bill and I have been busy these past few weeks looking at books that might win the Newbery with our Looking for Newbery posts. However, during that same time frame, I had a lot of fun joining @donalynmiller and @paulwhankins and many others on twitter for holiday #bookaday fun! The goal was to read a book a day and then tweet what you had read. The compiled list has been fun to follow - I've been fascinated to learn what type of books others enjoy. I have picked up quite a few titles to put on my TBR pile as well. But since we were doing the Looking for Newbery thing, I hadn't had an opportunity to reflect on my reading for my holiday #bookaday challenge. Today, I'm going to take a deep breath, and look back at what I've read over the holiday break (a short one for my school district; yes, that is a whine you hear :) ). 1st #bookaday - The Fantastic Secret of Owen Jester by Barbara O'Connor. I'm such a fa n of Barbara's. Readers who were fans of The Small Adventure of Popeye and Elvis will definitely enjoy this one as well. One event can change the humdrum life of a child in huge ways! What fun! Since Popeye and Elvis was our first read aloud of the year, and my students loved it, I can almost guarantee that Owen Jester will have a line of people waiting their turn to read it. #bookaday #2 - Jimi Sounds Like a Rainbow by Gary Golio. This was a book nominated for the Cybils nonfi ction picture book category, and I fell in love with it! The words are beautiful, it tells of Jimi's life before the bad times, and the illustrations are amazing. A wonderful mentor text in so many ways - a great literary nonfiction, similes, amazing word choice, and layout of story. So excited it won an award on Monday - loved it! #bookaday #3 - True (sort of...) by Katherine Hannigan. This is an ARC I was given at NCTE and I just got around to reading. Unfortunately, it doesn't come out until May. I liked it better than Ida B. and that's saying a lot. For more info on this book, check back; I plan to review it later this week. #bookaday #4 - Never Smile at a Monkey by Steve Jenkins. How prolific is this guy?! He had 3 different books nominated for the Cybils nonfiction picture books this year - wow! I plan to use this book with a few of his others to start a nonfiction study this month. #bookaday #5 - A Tale Dark and Grimm by Adam Gidwitz. The narrator's voice alone in this story makes it worth the read. Add to that, how well Gidwitz ties together all the story pieces and you have a very clever book. I actually reviewed this as one of the books for Looking for Newbery. #bookaday #6 - A Pig Parade is a Terrible Idea by Michael Ian Black and illustrated by Kevin Hawkes. This was recommended to me by my friend, Bill, as a wonderful mentor text for teaching the art of persuasive writing. Once I got past my giggles, I couldn't agree with him more! #bookaday #7 - A Conspiracy of Kings by Megan Whalen Turner. This title caught my eye when I was reading what Nina and Jonathan's mock Newbery group had to say over at Heavy Medal. As many people already know, Turner already has written one Newbery Honor Book (The Thief) that is a companion book to two others (The Queen of Attolia and The King of Attolia) as well as this one. I would probably have been better served if I had the background knowledge these books would have provided. That being said, this book was an intricate tale, full of twists and turns. Definitely not a book to be read without the utmost concentration. As someone who is a very quick reader, I had to force myself to slow down and really concentrate. #bookaday #8 - Dark Emperor and Other Poems of the Night by Joyce Sidman. Anot her title that caught my eye after all the love it received at the Heavy Medal Mock Newbery. I'm not sure what I expected, but it definitely wasn't the actuality. The layout of this book is amazing. A gorgeous poem on every left side of the page about a "creature of the night". Beautiful language; literally took my breath away in places. But, add to those poems, some great nonfiction writing on the right hand side. The possibilities for this as a mentor text are amazing. Can't wait to share Dark Emperor with my students!! #bookaday #9 - Penny Dreadful by Laurel Snyder. This was actually a recommendation from a friend, but I also starting hearing marvelous things about it via Twitter. It is a delightful story about a girl (very similar to me when I was growing up) who thinks life occurs in the same way a book plot does. It was delightful to see what happens when Penny opens herself up to the notion that sometimes life is not as orderly as the sequence of a book, and every moment in life is not always happily ever after. #bookaday #10 - Justin Fisher Declares War by James Preller. Bill and I got to meet an d spend some quality time with James Preller a couple of years ago when he came to our school. We enjoyed him very much and were delighted that, at the time, he shared with us the concept of his upcoming book, Bystander. We had some deep conversations over drinks about what bullies (the topic of Bystander) look like. Well, Justin Fisher is nothing like Bystander, but it is thoroughly enjoyable. Teachers will be nodding their heads as Justin's character is developed and we realize what a class clown he is. Most of us have had a Justin in our rooms. I also liked that Preller brought back Trey and Spider from Along Came Spider as supporting characters. #bookaday #12 - Smile by Raina Telgemeier. I think this is a book that will have more girl appeal than boy appeal. Another book full of middle school to high school angst, complete with losing two front permanent teeth, braces, beginning to like boys, trying to find the group of friends that best suits you, even if that means leaving the group with whom you've always been friends. The decision to do this as a graphic novel is perfect - seeing the pictures adds to the angst. Twelve books over break and that doesn't count the newest David Baldacci book I read, either. I thoroughly loved holiday #bookaday!! Like Karen I was shocked at the announcement of Moon Over Manifest. Not because it wasn't deserving, but because it came out of no where. As I compiled lists of possible winners for kids to read, it never crossed the radar. In conversations at Cover to Cover, it never crossed the radar. After I finished reading it, I liked it, but it never crossed the radar. I guess that's what makes this Looking for Newbery so fun. Some years we nail it and everyone knows before the big announcement. Then there are years like this one when we are totally surprised and everyone walks around saying "Where did that come from?" I can proudly say that I read 3 out of 5, including the winner. I also read and blogged about Turtle in Paradise and One Crazy Summer. I have Dark Emperor waiting for pick up at Cover to Cover, so that has to count for something. As far as the Caldecott, I was completely out. I actually read Interrupting Chicken in THE PIT and liked it, but sort of forgot about it. I like it a lot. It appears you enjoyed our series again, Karen and I are still debating whether we'll be doing it next year, but vote is in the yes column. Of the honor books, I had read Dark Emperor, One Crazy Summer, and Turtle in Paradise. They were all excellent reads, and I'm happy for all their authors. One honor book, I had heard of, but hadn't read. I will be getting my hands on Heart of a Samurai as soon as possible. But the winner was the one that really threw me for a loop. With all the online conversations and mock Newbery awards that I followed intently, I can honestly say I had never even heard of Moon Over Manifest. Surprises can be good things, though, and I am anxious to get my hands on this book as well. I just put in my Amazon 2-day delivery order tonight! So even though the winner was a total surprise for me, I really look forward to reading it. One of the best things I read in all the twitter chatter today, was a poem written by Kate Messner, which honors all the authors that wrote books in 2011, whether they won an award or not. When I think of how grateful I am every time I get my hands on a new book that I just love and can't wait to share with my students, this poem really hits the nail on the head. So, my final thoughts on this day are merely to leave with you Kate's lovely poem . Enjoy! It's funny what a difference a year makes in this whole book awards game. Last year at this time pretty much everybody was in love with When You Reach Me for the Newbery and The Lion and the Mouse for the Caldecott. After looking over a few of the blogs recently it's pretty clear that nothing is very clear! The predictions are all over the place. With that being said, today is the day we take our shot and name our picks for the Newbery. Since I don't have any idea what the winner will be and really don't have a strong feeling for a book this year, I'm going to follow Franki's example and list books that I would love to win something this year. I'm really just hoping I've read the winner and it doesn't come totally out of left field. Much like Bill, I have no idea what will win this year. There are many outstanding books that I have read this past year, and even these past two weeks. But I still truly have no idea which one will win the Newbery or be one of the Honor books. That being said, there are several books that have truly spoken to me for a variety of reasons. Those are the books that will be my picks today (in no particular order). We have had a fun two weeks reading books, reviewing them, and writing our Looking for Newbery series. Thanks so much for joining us for the fun! This is the last review Bill and I will post before making our predictions (sort of) tomorrow, the day before all of our favorite ALA awards are announced -- yay!! Now that I have that out of my system, the last (but definitely not the least) book we'll talk about in our Looking for Newbery series is The Kneebone Boy by Ellen Potter. First of all, I loved SLOB by Ellen Potter, so long before I knew The Kneebone Boy had some Newbery buzz surrounding it, I had wanted to read it. SLOB was so well done, with amazing character development, wonderful language, and some great surprises for the reader at the end. The Kneebone Boy has all of that as well, and pays equal attention to the clarity of detail and the importance of surprising the reader (not to worry, no spoilers here). This story is about the three Hardscrabble children: Otto, Lucia, and Max. One of them is the narrator of the story, however the narrator never tells the reader which child he/she truly is. I definitely have my suspicions, but would love to talk to someone else who has read this book to see what they think. And don't even get me started on the eccentricities of those supporting characters! Potter is truly a talented writer to be able to conjure up so many amazing personalities. But it's not enough to have great characters; if an author doesn't have a story worth telling, the premise will far apart. Happily, that is not the case for The Kneebone Boy. It has a great plot with several subplots woven in as well that tie together very nicely in the end, and results in a fabulous book. I won't be a bit surprised if The Kneebone Boy gets some love from the Newbery judges. It is well written and most definitely distinguished! And so there you have it: 13 days of Looking for Newbery. We hope you've enjoyed spending time thinking about some of these possible Newbery contenders with us. There are other very worthy books we didn't get to talk about with only 13 days this year, so we apologize if we didn't include one of your favorites. It certainly has been fun having you stop by. Please come back and visit on Sunday for our final wrap-up, and some predictions. A Long Walk to Water by Linda Sue Park is a book that makes an impression from the start. Based on the life of, Salva, one of the Sudan's "Lost Boys" from the late 1980s, the story moves back and forth between his search for his family and a safe place to live and the life of Nya, a girl currently living in Africa. Salva's story is one of bravery as he walks from his home land that is ravaged by war to a refugee camp. He and his fellow travelers are challenged along the way by wild animals, thirst, hunger, enemy tribes and just the shear distance they have to cover on foot. Upon arriving in one refugee camp, they are forced to leave, many of them drowning when they are forced to cross a swollen river in order to escape. Salva finally arrives in a camp where his learning is encouraged by and English speaking man and Salva is finally airlifted to the United States where he is taken in by a family in New York. Nya's story is one of a young girl living in Africa where she must walk to retrieve water from a stagnant pond. During the dry season many of her fellow villagers fall sick to the water born diseases found in the water. Despite efforts to educate the people about the dangers of drinking unsanitary water, they really have little choice. Both stories are told at the same time switching back and forth seamlessly and leading the reader to an inspiring conclusion that is one of the most satisfying I've read this year. Told in only 128 pages most kids can read this one in a matter of hours making it a great example of how much can be said with just the right words. This is one of my favorites, and should be shared with all middle grade students for the inspirational, motivating message it presents. Woods Runner by Gary Paulsen is a book I found early last year; in fact I read it soon after last year's Newbery awards were announced in January. I fell in love with the gritty, survival nature of the story, and so was delighted to see it mentioned on several mock Newbery lists. Paulsen didn't pull any punches when it came to some of the travesties of war. In fact, in the afterword, Paulsen specifically says that he didn't try to "clean up" the details of the War for Indpendence. He lets the reader know that this was long, bloody war of 8 years. I admire that he didn't gloss over details, but told a fictionalized story about a boy trying to survive and find his parents against a backdrop of some pretty horrific incidents. Woods Runner is historical fiction, but Paulsen puts a very unique twist in with his fictional story. Before almost every chapter, he has inserted factual information that helps build the reader's b ackground knowledge about the time, people, and events in the story. I've heard some people say they thought it detracted from the story, but for me, that factual information was critical to my understanding of this time in history. I really loved Woods Runner in all its format. For more of my thoughts about WoodsRunner, check out my post last January. I would really love to see Turtle in Paradise by Jennifer Holm win something this year. To me, it's the perfect Newbery book, great writing, excellent story, engaging characters and most importantly...KID FRIENDLY! I have put this book into the hands of a large number of students and all of them have loved the story. Each one passes it to a fried with glowing descriptions and the book is never on the shelf. Each student has a different reason for liking it, some of them pick out one of the characters that really speaks to them, some of them love the setting because they've visited Key West, and some of them love it because they are fans of Jennifer Holm's other titles. Whatever the reason, all of them love the story. It's fun and entertaining with enough twists to keep the reader moving. I wrote a full review of the book back in June and called it the perfect summer time read. Well now that the thermometer isn't going much above 30 and the sun is a rare sight in Columbus, I'm calling it the perfect winter time read. Just start reading and picture yourself on the sun drenched beaches of Key West, you won't be disappointed! I had heard so many great things about A Tale Dark and Grimm by Adam Gidwitz from my online friends at twitter, I just had to make sure I read it over holiday break. And then, I was reading comments again over at Heavy Medal (I follow this blog a lot before the ALA awards), and A Tale Dark and Grimm was actually being talked about in conversation as being a possible Newbery dark horse (it would depend on whether the committee gave Gidwitz credit for an original idea since he borrows a little from the Grimm's fairy tales). The different tales are woven together in an immensely clever way. Who knew Hansel and Gretel were soooo much more than a little boy and girl looking for a sugar fix? The narrator in this book has such great "voice". The narrator had me chuckling throughout the book, even though the stories aren't necessarily of the chuckling nature. That being said, a word of caution: these tales stay more true to Grimm's actual tales - there is not happily ever after and the story can be very dark. Oh, and lots of blood too. As the narrator warns time and again, this story is not for the faint of heart. But the darkness, the fighting, the blood - they're all written with the most amazing language. If the Newbery is about "distinguished" literature; literature that stands out from the rest of the pack, then A Tale Dark and Grimm most certainly could be a contender. I was not a fan of The Underneath by Kathi Appelt and I know that puts me in something of a minority. 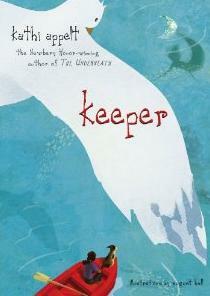 I probably would not have read Keeper based on that opinion alone except that it was showing up on a lot of Newbery watch lists which put it on my list of books I needed to read. I liked it better than The Underneath, but they are very similar in the writing. Kathi Appelt moves between characters both human and animal telling her stories from many points of view which sometimes is confusing for kids. Several kids I know who read the book expressed this confusion to me telling the real from the unreal and who is talking when. I tried the fairy tale comparison where animals talk and people believe in creatures, but most of them weren't buying, a couple chose to abandon the book. Keeper is the story of a young girl whose mother abandons her, leaving her with a young woman named Signe. Signe tells Keeper that her mother is a mermaid who returned to the sea after giving birth. Keeper grows up believing that she is half mermaid, her mother will return for her, and she will become a mermaid living in the sea. Her belief is so strong that at the climax of the story she, her dog and a seagull crawl into a rowboat to sail to the sand bar where the mermaids will be meeting under the blue moon. The tension created in this part of the book kept me reading because I had to see if Keeper and her crew would survive. It also drew me in because I wasn't' sure where the author was going. Would she continue the fairy tale showing Keeper's mother to be a mermaid? Or would she go the dramatic realistic fiction route and show that Keeper's mom was a woman not ready for motherhood? In addition to Signe, Keeper and a host of animals, there are other very interesting characters that help raise Keeper. Mr. Beauchamp lives next door with his one eyed cat and dreams of long ago when he was young. Just down the road lives Dogie. Dogie runs a surfboard rental business out of an old school bus and pays Keeper to wax the boards for the customers. Together these characters make up sort of a family living along the Gulf Coast in Texas. I really liked the characters and the descriptions of life along the beach. 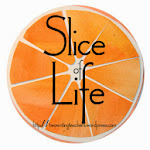 Kathi Appelt creates a simple beach life attitude with her words. It was easy for me to put myself on the coast for the telling of this story. Overall, I liked Keeper but it wasn't one of my favorites. Happy New Year! We hope 2011 is wonderful year for you! And also a big Happy 5th birthday wish to our friends, colleagues, and mentors at A Year of Reading - congratulations to Mary Lee and Franki!! Today's Looking for Newbery pick is Touch Blue by Cynthia Lord. I read it this past summ er and fell in love with it! I'm not sure how many Mock Newbery conversations have discussed this as a possible winner, but I'm throwing it in as one of my possiblities because I loved the story line, the way the characters developed, the beautiful language, the setting (an island in Maine), and the fact that the main character's family makes their living by being lobstermen. Add in the symbolism that is so powerful in the book, and you know that Touch Blue is a quiet gem that needs bigger accolades. I'm not sure if Touch Blue will be in Newbery consideration or not, but regardless, it most definitely is a book to which many students should be exposed. For further specifics about how wonderful I think Touch Blue is, check my blog post from July. I think Cynthia Lord is a truly gifted writer, and this book is her at her best.